With so many holiday leftovers I just HAD to make turkey pot pies! These are designed to use ALL your leftovers, including veggies, gravy, and meat. I made a pot of turkey broth, and used it in the pies – or use your favorite broth. This Paleo crust is made of coconut butter and chia seeds! It’s very easy to roll out with a rolling pin. This crust is a slight modification of my Perfect Gluten-Free Coconut Pie Crust, which is great for larger pies. Baking in cups is easy and safe, as they’ve been fired for use with hot foods. 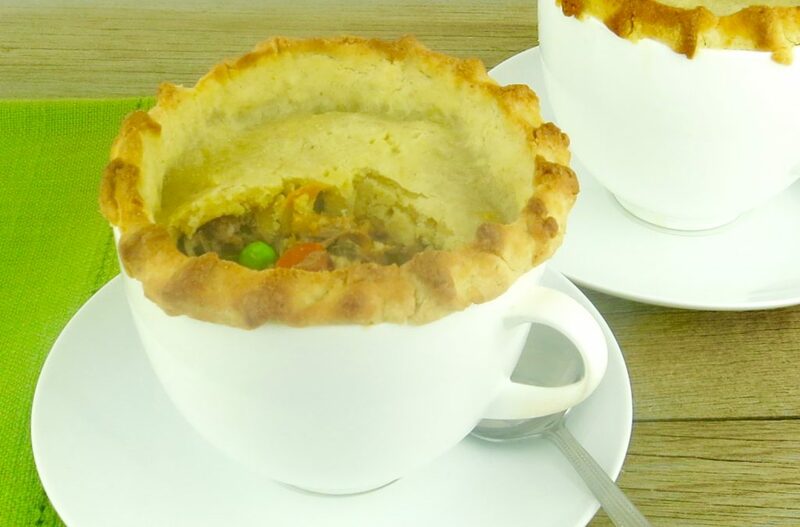 I used 2 16-oz cups for this recipe, which makes 2 large pot pies. If you have more hungry eaters around, multiply the recipe accordingly. 150 grams hard coconut butter (2/3 cup softened). If mixing by hand or don't have a scale, soften it gently by putting the container in a bowl of lukewarm water. 1 tablespoon ground white chia seeds. Grind first, then measure. 2 tablespoons coconut flour, if needed to thicken dough. Cooked veggies: Use leftover veggies, or saute: 2 tablespoons coconut oil, 1 clove garlic crushed, 1/2 medium onion, 1/3 cup diced carrots, 1/3 cup diced celery, a handful shitake mushrooms, 1/3 cup frozen peas. 1 cup rich Bone Broth including any leftover turkey gravy. 1/4 cup diced fresh herbs or 2 tablespoons dry: sage, thyme, rosemary. Preheat oven to 350 °F. Melt coconut oil in large skillet on medium-high heat. Add your leftover veggies. (Or saute garlic, onion, carrot, celery, and mushrooms. Cook and stir 5 minutes. Add peas, cook and stir 3 minutes or until tender.) Stir in the turkey. Season with salt and pepper. Check the dough consistency. It should be very thick and pliable. This dough is like clay and very temperature sensitive. If it's too stiff, you can warm it with your hands to soften. If it’s too wet to roll, you can knead it with a tablespoon or two of coconut flour. If it is too thick to roll, warm it with your hands, or beat a fresh egg and add it in increments until the dough is pliable enough to roll. Divide the dough in two parts. With a rolling pin, roll out one piece of dough at time on a piece of parchment paper into a disk about 1/8 inch thick, and 1/2 inch larger than your baking cup all around. Dust with coconut flour to prevent sticking. Flip the rolled dough onto your cup, repair any rips, fold and crimp the edges with your fingers. Press excess pastry so it stands up along the edge of the cup, not the outside, as the pastry may melt and slide down the outside of the cup during baking. Make 3 fork holes in the top of the pastry. Place cups on a baking sheet, and bake 20 to 25 minutes or until pastry is puffed and golden brown. Serve immediately.